The Canon PowerShot S110 is the next generation digital ELPH, it retains many of the features that made the PowerShot S100 the most popular digital still camera in the market including its ultra-compact and elegant stainless steel design. 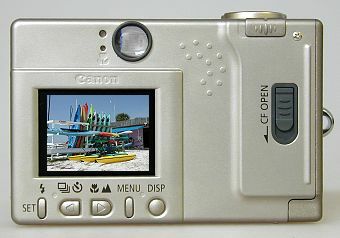 The PowerShot S110 is a 2.1 megapixel camera which incorporates new and improved features including direct print capabilities from the Canon Card Photo Printer CP-10; 20 frame-per-second movie clips with audio at selectable resolutions up to 640x480 pixels; a choice of nine image quality modes; shutter speeds from 1 second to 1/1500 second; an adaptive primary color filter for improved color reproduction; automatic exposure sensitivity adjustment; a new high-speed digital signal processing IC with low power consumption; and a high-output light guide flash. A new digital signal processing IC in the PowerShot S110 enables high-speed image processing and rapid data transfer through the cameras' USB interface. Due to the new digital signal processing IC, the S110's movie clip processing speed is approximately 2.7 times faster that other models in its class. The PowerShot S110 also features a 2X (equivalent to 35-70mm in the 35mm format) f/2.8-4.0 all-glass aspherical lens, 3-point autofocus, and continuous shooting at 2.5 frames per second. The new camera measures 3.5 (W) x 2.3 (H) x 1.0 (D)-inches and weighs approximately 6.8 ounces. The PowerShot S110 features a 1/2.7-inch, 2.1 megapixel CCD sensor that creates full color or black-and-white images up to 1600x1200 pixels when set to the camera's Large resolution mode. The camera also offers additional resolution settings of 1024x768 and 640x480 when set in the Middle or Small modes, which are ideal for on-screen applications, such as Web sites and CD-ROMs and allow more images to be recorded on a single CompactFlash memory card. 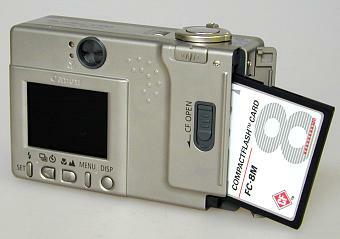 The new camera is compatible with Type I CompactFlash Cards and will be shipped with an 8MB CF card. The new PowerShot S110 is supplied with the following standard accessories: 8MB CompactFlash Card, Lithium-Ion Battery Pack NB-1L, Battery Charger CB-2LS, Interface Cable IFC-200PCU, AV Cable AVC-DC200, Wrist Strap WS-110, User's Guide, Software Starter Guide & System Map, Canon U.S.A., Inc. Limited Warranty, Canon Digital Camera Solution Disk v5.0 (for Mac & PC), & ArcSoft Camera Suite Software Disk (for Mac & PC). The PowerShot S110 digital camera will be available in June and have a suggested retail price of $599. Is that really a digital camera hiding behind that credit card? The only real physical difference between the PowerShot S100 and the new S110 is the nameplate and the addition of a small microphone on the front. The bright 1.5" color LCD uses energy-efficient white LEDs for backlight illumination and has a non-reflective coating that reduces fingerprint and nose smears. The user controls are minimal but highly functional. Except for the power button, the shutter release and the zoom lever on the top, all other controls are located on the back below the LCD. The slide switch (upper right) lets you quickly switch between record and play modes. You access the onscreen menu to go from the Automatic (default) record mode to the Manual, Stitch Assist panorama or Movie mode. In Manual mode you can change the EV compensation, the White Balance, the Image Size/Quality or enable the B&W mode. See page two for all the details. The lever that controls the zoom lens in record mode works as the index and zoomed playback control in Play mode. The Power button must be depressed for more than a second to prevent accidental powerups. Below the shutter release is the slide lever to select record or play mode. On the bottom is a metal tripod socket and the battery access door. 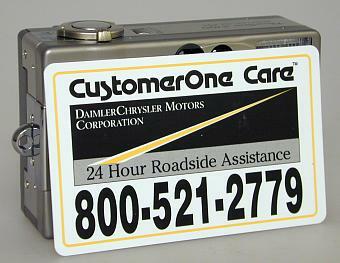 When mounted on a tripod the camera does not need to be removed to change the battery. All of the Digital ELPH's I/O is handled through one port. Cables are supplied for Video Out and USB data connections. 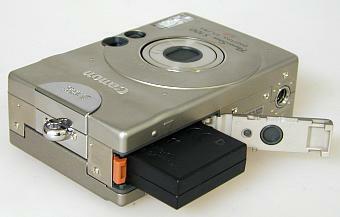 The PowerShot S110 is equipped with a Type I CompactFlash card slot and comes with an 8MB CF card. It uses the same type of ejector mechanism as the S20 and S10 cameras so be ready to catch the card as it really "pops out" when the button is pressed. The S110 comes with a new Canon NB-1L 3.7v 680mAh lithium rechargeable battery pack and a 110/240V CB-2L 2-hour rapid charger (N. America) that plugs directly in the wall. Because of the Digital ELPH's small size it's very easy to take it with you wherever you go. Here it is compared to the pocket-size Fuji 6800 Zoom. *Not supported on Mac OS X at the time of May 2001.